I think receiving the last Battlefield just before the newest entry in the series is kind of cool. 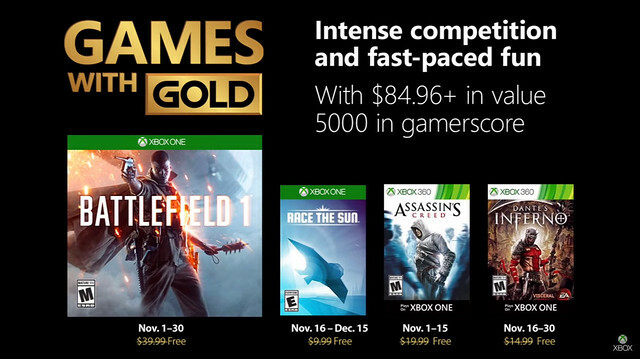 I wonder, however, is this will cause people to delay buying releases in the series if the public consciousness is to wait for BF titles to go XBox's equivalent of FTP. Is the Battlefield 1 story mode worth playing? I thought it was worth going through. Not all of it is strong, but it is varied and overall pretty enjoyable for a Battlefield campaign. I only played the flight missions and of 5 flight missions, you spend 3 of them on the ground and then you land on a zepplin and fight hand to hand in one of the other ones. Really disappointing. Dante's Inferno is totally underrated. It's a great GoW clone, especially if you didn't have a Playstation to play GoW. Biggest problem I found, was the slog at the end. Pretty fun, though. Amazing game! Thumbs way up!